X.A.N.A. has gained control of the Super-computer’s “return to the past” program. At first, our heroes struggle to understand why it would do such a thing… but before long, they realize that Sissi has been possessed by X.A.N.A.. She is trying to wipe them out! Then finally, the penny drops; the “returns to the past” have been increasing X.A.N.A. 's power and now their enemy is strong enough to control human beings…New dangers in store! 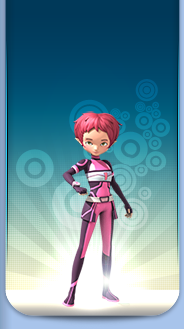 Aelita is looking for information on the interface in Sector 5 along with Odd, Ulrich and Yumi who are fighting Mantas. Aelita sends the information to Jeremy then closes the interface so he can work on the data. Jeremy virtualises the vehicles… Our heroes then take the tunnel and go back to the factory where Jeremy tells him he’s launched a program to sort the data. Everyone returns to Kadic but Jeremy and Aelita are recorded talking about Aelita being virtual and her antivirus on Sissi's walkman. Meanwhile, the camera returns to the factory and we see the computer screen light up with red lines appearing in the code. Jeremy’s alarm clock goes off at 7am and the brainiac gets up. Meanwhile Yumi is reprimanded by her dad about last night when she came home at 3am. Sissi then talks to Jeremy and shows him her recording. During Ms Hertz’ class, the group of three discuss it and Ms Hertz asks questions on the lesson that Odd can’t answer, which is met by laughter from the class. Neither Jeremy nor the others understand what happened. During Ms Hertz’ class, Odd responds correctly to all her questions, which surprises her enormously. Ulrich does his pencak silat class again with Sissi and explains to her that Jeremy and Aelita have made up stories about virtual people. Jeremy scans the programs and realises that XANA has modified the Return to the Past thanks to the data they recovered from Sector 5; they were booby trapped. A Return to the Past will take place again. Jeremy then finds the tower XANA activated, in the Mountain Sector. Meanwhile Sissi listens to the recording and Ulrich pretends to be surprised. The Return to the Past begins again and we return to the moment when Jeremy gets up at 7 that morning. 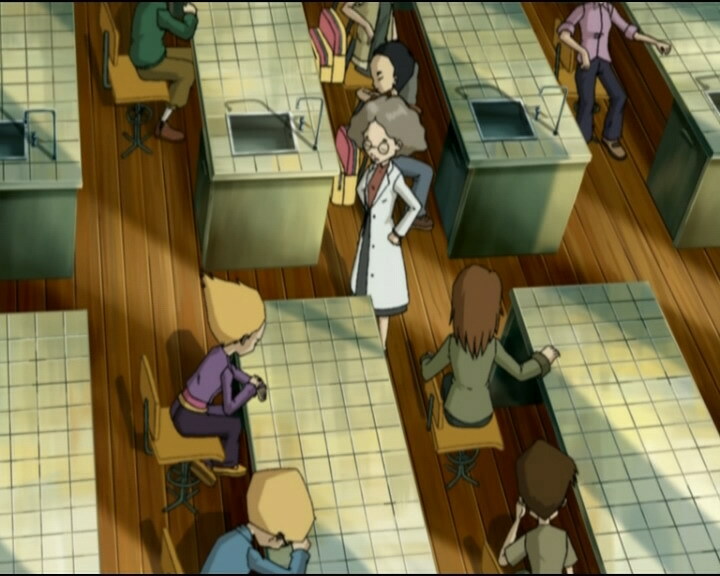 After having relived their day, everyone goes to Lyoko. At first nothing is waiting for them, then an army of Hornets arrives. Ulrich and Yumi fight while Odd and Aelita go to the tower. Meanwhile, Sissi tells her father everything and he decides to call Odd’s parents. 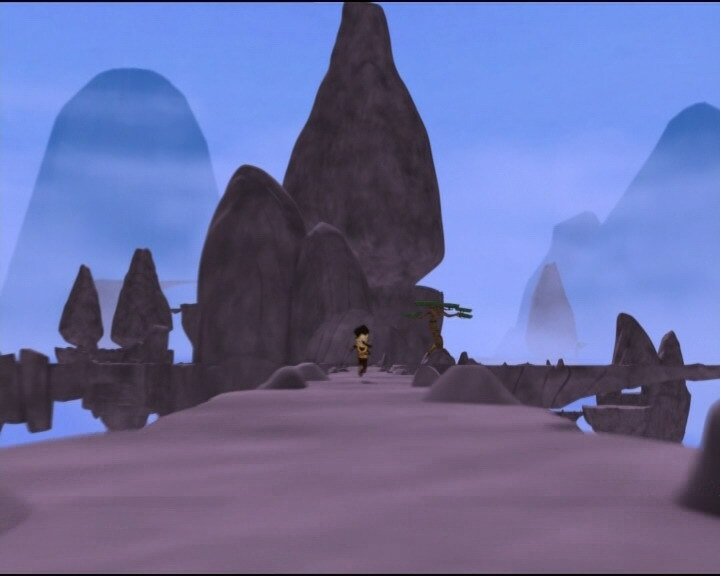 Yumi is devirtualised; Odd and Aelita arrive near the tower but Hornets catch up to them. The Return to the Past is launched once again. New problems arrive: firstly, Aelita hasn’t come back to Earth, secondly, XANA has taken control of Sissi who stops Jeremy from going to the factory. Yumi, Odd and Ulrich wait for Jeremy but he never arrives. Aelita is then found by the Hornets and they chase her. Jeremy is still trapped by Sissi who tells Herb and Nicolas to take Jeremy to the school’s boiler room. Odd and Ulrich then appear. Ulrich takes care of Sissi while Jeremy and Odd go back to the factory. On the way there, Jeremy explains to Odd that the Returns to the Past allow XANA to gain more power. 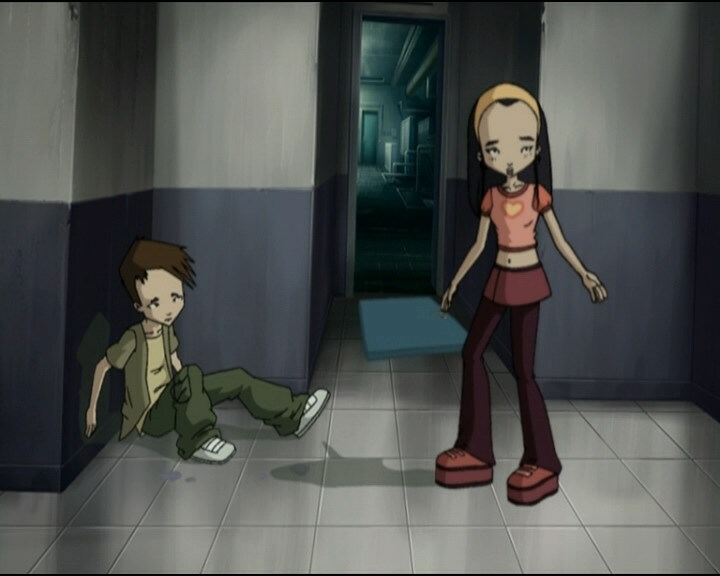 On Lyoko, Aelita is trapped: a Hornet and the Scyphozoa have ambushed her but Odd and Yumi arrive and free her. Jeremy announces the imminence of another Return to the Past. 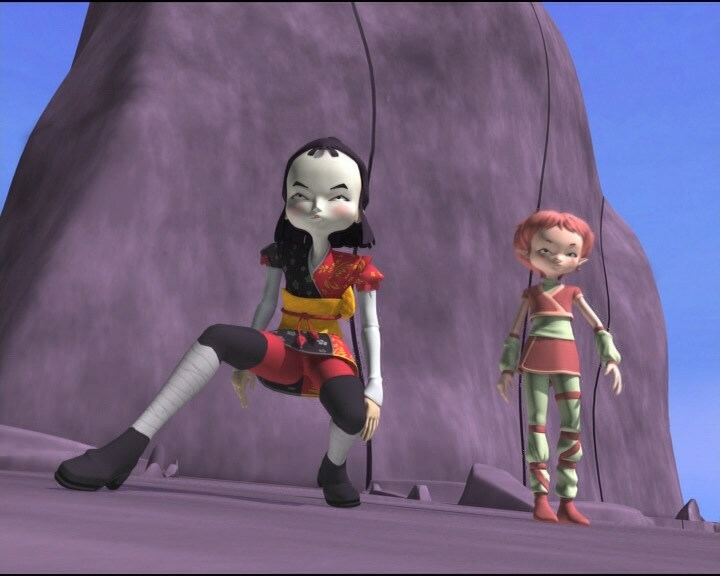 Yumi, Odd and Aelita try to get to the activated tower but a Tarantula guards the entrance. 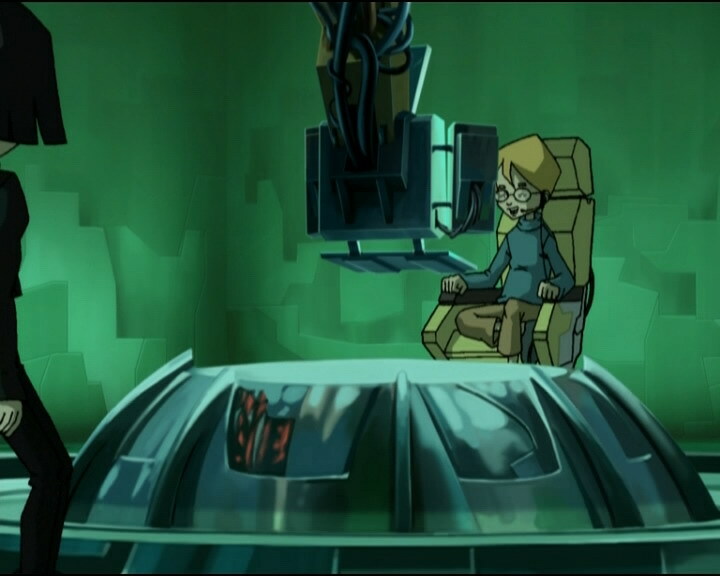 Jeremy then deactivates the Return to the Past with a code Aelita found in Sector 5. Aelita enters the tower and deactivates it while Ulrich is at the point of almost being hurt by Sissi. After the tower’s deactivation, Sissi can’t remember anything, but when she sees her broken walkman (damaged in the fight with Ulrich), she begins to sulk. The team of heroes then talks about the point of this attack and realise that they’re facing a more powerful XANA, boosted with each return in time, and who now has the power to control human beings. - Attack: XANAfy Sissi to prevent Jeremy from going back to the factory and fixing the bug in the Return to the Past! - XANA can now take control of people (XANAfication), give them superpowers, superhuman strength and shock resistance! - RTTPs make XANA stronger. - Yumi now has two fans! - First time Ulrich rides on the Overboard. - First time a character other than Ulrich uses his sabre. - Ms Hertz gives detention to people who skip her class. - Yumi would sometimes like to tell the truth about her friends’ secret to her parents. - How can Yumi talk to Aelita without the microphone? - The principal’s eyebrows are grey when he talks to Odd’s mother on the telephone. 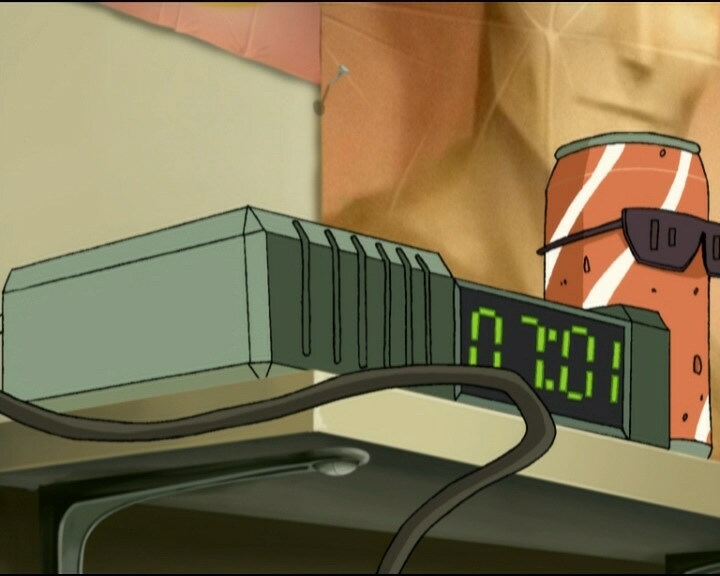 - It says it’s Monday at the bottom of the screen at the start of the episode. If you want to be nitpicky, you’ll notice that it’s already Tuesday at 3 in the morning because our heroes only get 4 hours sleep. - After Yumi cuts the Tarantula’s front legs, in the next shot they’re intact. - Yumi’s outfit is reversed in one scene when she jumps over the Tarantula. - The iron bars Sissi broke change colour when they roll towards Ulrich, Odd and Jeremy. 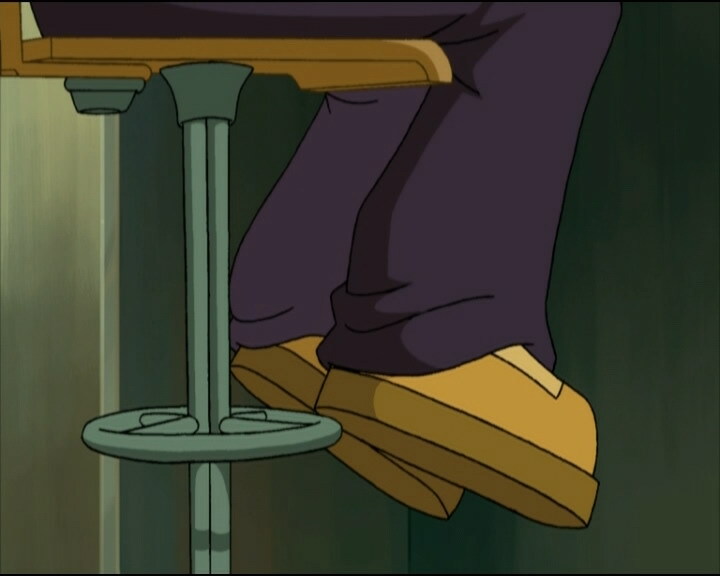 - Odd’s pants are entirely the lighter shade of purple when Yumi says that Ms Hertz has given them detention. - Odd’s undershirt disappears from his torso when the four fighters exit the lift at the start of the episode, and when Sissi demands to know what the group is up to. - Sissi’s belly is the same colour as her skirt when she’s stunned to hear Ulrich wants to ask her something. - Sissi’s hair disappears when she spies on Jeremy and Aelita up until when she stops the recording. - When the spectre leaves Sissi, in the following shot it’s not the same. - Herb’s hair is entirely black when he’s amazed to see Jeremy on the ground and when Sissi takes an iron bar. - When Sissi becomes herself again, the damage she caused to the wall is not visible anymore when there was no return trip. 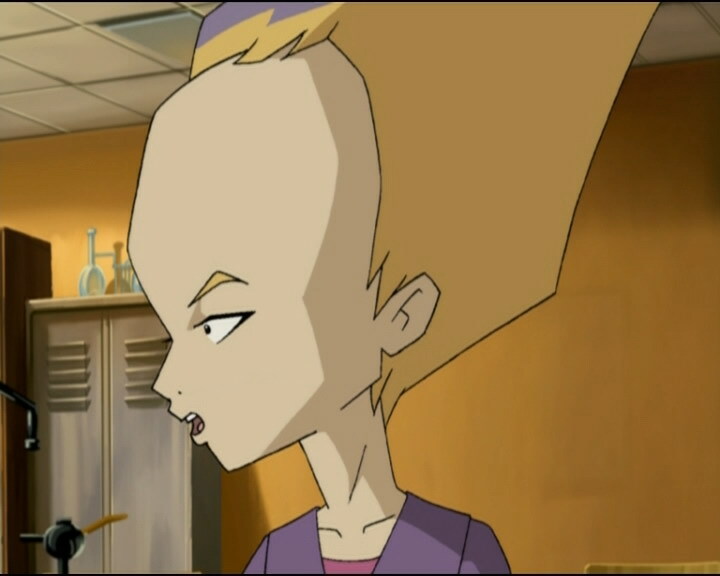 - At the end Yumi says Ms Hertz gave them 4 hours detention each, but she’s not in the same year as the boys and Aelita and therefore Ms Hertz shouldn’t have punished her as well. - During Ms Hertz’ class, Nicolas disappears and is replaced by Caroline Savorani who’s in year 9. - The factory microphone disappears from Jeremy’s ear, reappears after the second RTTP, and before he sees XANA launch the RTTP it’s in his right ear as well as when he succeeds in stopping the RTTP. - First mention of pencak silat, Ulrich’s martial arts style. - First time a tower is deactivated but no return to the past is launched. - First episode in which Sissi is XANAfied. - First episode beginning in Sector 5. - Second episode in which the RTTP is launched more than one time. 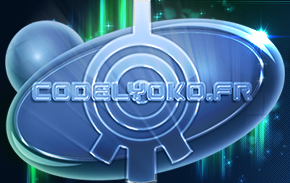 - Falling from a great height costs life points on Lyoko. - Ulrich: "No sweat, it’ll be just like the good old days!" 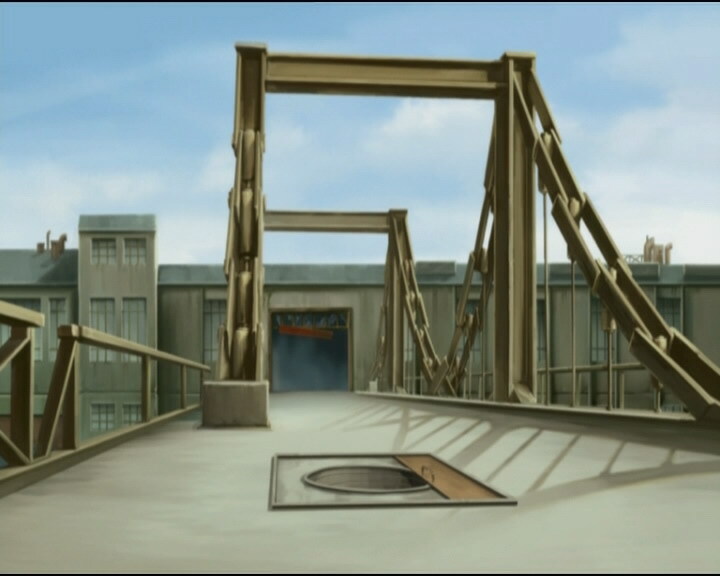 Allusion to season 1 in which they didn’t have vehicles. 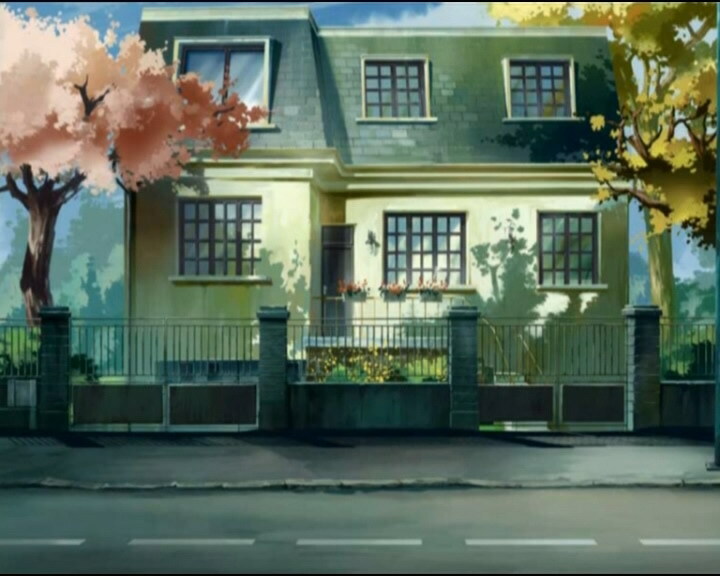 - Mr Ishiyama seems angry at the idea that Yumi comes home late because she’s seeing a boy, even though he was happy with the answer in the previous episode. - There’s no return to the past at the end of the episode, so we can ask why there was no suspicion about the destruction of the boiler room and Sissi's behaviour. - Aelita hides by making a rock wall around herself with her Creativity, just like in episode 23, “Rock Bottom?”. The design of the rock and Aelita’s movements as the Hornets break it down are almost identical, right down to the camera angles. Jeremy: What about the Mantas? How’re we doing? Odd: And judging by the size of the nest, we’re gonna have some big, bouncing babies! Odd: Still just babies and check ‘em out! Ulrich: What do you think they are, male or female? Odd: Considering their tempers, they gotta be girls, right? Ulrich: Just watch, I’ll show ‘em what it is to be a guy! Yumi: Jeremy, tell me; do I really need to hear this? Jeremy: Uh, sorry Yumi, but you can’t always choose your friends! Odd: Oh shoot, what are we going to do with our free time, I mean if we can’t save the world anymore? Yumi: You might study a little more and learn something for once! Aelita: I can’t believe that soon I’ll be really real! Jeremy: Well to me, you already are…very real, I mean it! Radio: It’s Tuesday already! No, you’re not dreaming, or rather you’re not dreaming anymore! Mr Ishiyama: Hmph! I can’t help but wonder what a girl your age could possibly be doing out at such a late hour! There’s a boy behind this, isn’t there?! Yumi: I couldn’t exactly tell them that there were three friends involved and all of them boys, could I? That would have really freaked ‘em out. Ulrich: Why didn’t you just make up a story? I do it all the time with my parents! Herb: Don’t you think Jeremy looks happy this morning? Ms Hertz: Excuse me, you three, but do you mind if I teach a class here? Odd: Not at all ma’am, after all, it is your job. Ms Hertz: Yes, and my job is to also ask questions, isn’t it Odd? So would you be kind enough to tell me the mass in moles of two oxygen atoms? Ms Hertz: 32 grams per mole. And the principle of photosynthesis? Ms Hertz: The synthesis of oxygen from plants possessing chlorophyll placed in light. Alright, here’s an easy one now: which student in this graduating class is the biggest failure in science who, nevertheless, takes the liberty of not listening to my lessons? Ms Hertz: Bravo! Well done, Odd! You see what you can do when you apply yourself? Sissi: I’m so happy that you finally decided to give me a lesson in penchark kilat! Sissi: Oh, whatever. Well, I wonder what could’ve made you change your mind all of a sudden! Odd: Is it this one? Herb: Maybe this is what you’re looking for? Nicolas: You were right, Sissi, as usual! Herb: They were after the minidisk! Sissi: Oh, well, gentlemen…did you think you were smarter than me? You don’t know me very well! Mr Ishiyama: Yumi, I have to talk to you! Yumi: Papa, I know what you’re gonna tell me, you’re totally right. Ok, I’m sorry! Aelita: Then how do you explain the fact that Tuesday’s starting again? Ulrich: At least we’ve got a second chance to get Sissi off our backs. Sissi? Oh, I’m so glad to see you! Sissi: What? You are? But-but…you see, I er, I wanted to talk to Jeremy! Ulrich: Oh, that can wait. There’s something I’ve been wanting to ask you for a long time, but…I just can’t bring myself to do it! Ulrich: Would you like to learn…pencak silat with me? Ms Hertz: So, would you be kind enough to tell me the mass in moles of two oxygen atoms? Odd: 32 grams per mole, ma’am! Ms Hertz: Uh, oh! Yes…uh, that’s right…uh, very well, Odd! Now please, would you explain to me the principle of photosynthesis? Odd: Of course, ma’am! That would be the synthesis of oxygen from plants possessing chlorophyll placed in light. Ms Hertz: Odd! Is it really you? You haven’t been replaced by a clone? Odd: No ma’am, why? Is something wrong? Ms Hertz: No, er, no. Let’s go on with our lesson! Odd: Wow! Hey, being a good student’s so cool! Ulrich: Uh…Sissi? Could I talk to you as a friend? Sissi: Sorry? As a what? Ulrich: Well, um…y’see…they-they’ve kinda lost it. For some strange reason they think they’re…virtual people! Yumi (seeing Odd with a textbook): Odd, you mind telling us what you’re doing over there? Odd: I’m studying! That’s what you wanted me to do, wasn’t it? Ulrich: It’s even worse than I thought! They’ve gone right off the deep end! Ulrich: Oh, it’s much worse, they’re totally out of it! Jeremy: He didn’t take control of jumping back in time for the fun of it! Odd: What’s fascinating is that plants use the sun’s energy to change water and carbon dioxide into glucose, and in exchange, give off oxygen! Ms Hertz (who can’t believe it): Odd, if you keep this up, you’ll be teaching the class instead of me! Odd: Oh, I certainly don’t know as much as you, Ms Hertz! Ms Hertz: I’m beginning to wonder! Ulrich: I really don’t think I could be as clever as yesterday, not like Odd! 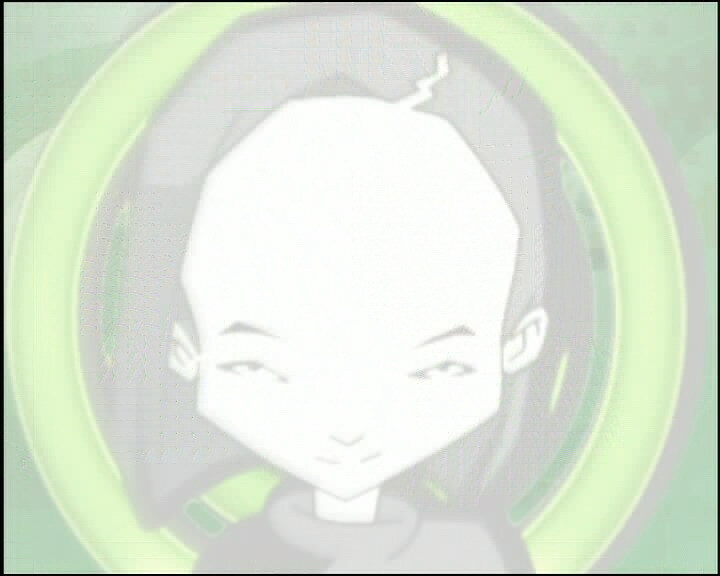 Odd: Welcome to Lyoko, ladies! Ulrich: Too quiet if you ask me. Odd: You can never really enjoy the present moment, can you Ulrich? Yumi, Aelita and Odd: Huh? Ulrich: Oh, yes I can! Jeremy: Guys, on your right! It should be a path that leads to the Tower. Odd: With a platform to land on? Principal (taking the headphones out): Hm, these little machines work very well! Sissi: Daddy, that’s not the point! Jeremy: If only I had more time to find a solution! Yumi: Cheer up, Jeremy. You’re about to get another day! Jeremy: Sissi, I already know what you’re gonna say, but I don’t have time. Aelita: But what are you doing? I need you over here! Yumi: We’re waiting for Jeremy. Without him, we can’t do anything! Odd: Ok, we’ll find him! Jeremy: Sissi…you’re not yourself! XANA has possessed you! You must not obey him! XANA-Sissi: I’ve never felt so good! XANA-Sissi (seeing Nicolas and Herb): Ah, there you are! Help me to transport this simpleton to a safer place! XANA-Sissi: Perfect! They’ll never think of looking for him here! Herb: But Sissi, what’s going on? Jeremy: Odd, Ulrich! Look out! Sissi is possessed by XANA! Jeremy: With…the jumps back in time! Odd: Jeremy, do you mind saying that in English? Jeremy: XANA’s started another jump back in time. We might have to start all over again! Odd: I’d really rather not, Jeremy! Jeremy: We just have to make it to that darn tower! Odd: And we’re not there yet! Odd: You know, if our homework is on photosynthesis, I just might get the only good grade in my entire career as a scholastic washout! Ulrich: We’re gonna have to be very careful. The next round is gonna be tougher than ever.